If you have a UNIQUE business concept that you think will be successful in NNY let's meet up next week! These meetings will be informal one-on-one's to review your idea. I've had some requests for Saturday meetings and I think I'll have some Saturday availability as well. Based on the early response, I think this could be a regular meeting of entrepreneurs in the North Country. Spread the word to anyone you know that might be toying with the idea of starting a business. Have a business idea for NNY? Pitch Grindstone Financial next week! You've probably flipped past the terrible ABC version (Shark Tank) of the CBC's Dragon's Den and wondered what's going on there? If you ever get a chance to watch the original CBC version check it out it's much, much better (and it's my daughter's favorite show). The point being that Shark Tank/Dragon's Den are effectively venture capital pitch sessions. The most fun I ever had during my career on Wall Street was as a member of a venture capital firm listening to thousands of pitches from start-ups around the country and trying to identify the winners when they were nothing more than an idea on a sheet of paper. Well, I'm on the verge of kicking off a couple of new business opportunities of my own and that got me thinking that there may be others in NNY with good ideas that just can't get their ideas to market. As someone who has helped companies launch in the past, I think can help you navigate the choppy waters of start-up land. What can I do for you? Connect you with start-up cash - either debt or equity infusions, help you understand the challenges and potential rewards with your idea, develop new markets or target verticals that you've not thought of previously, etc. If you can't make it during business hours - I imagine many people with great ideas actually have jobs :) - shoot me an email and we'll set up an evening or weekend session if there is enough demand. If I get a good response maybe I'll make this a monthly or quarterly idea. Pass this along to your friends and let's get to work! Florida seems to be moving forward with plans to have a January primary which means the entire primary schedule will be tossed up in the air. I'm in favor of larger states gaining a more significant say in the primary process because the power granted to states which are not very representative of the US population is a flaw in our system. However, I suspect that this is going to lead to a "date race" where every state moves to be the first -- particularly among battleground states. The best proposal I've seen is that we should divide the country up into 5 blocks of 10 states and then rotate the order of their primaries every election. If the Northeast block goes first in 2012, then the Midwest could go first in 2016 and the South in 2020. This would help ensure that everyone in our country is engaged in the primary process at least every 8-12 years. On a related election note, this story out of Salon.com is just too scary to ignore. "Voting machines used by as many as a quarter of American voters heading to the polls in 2012 can be hacked with just $10.50 in parts and an 8th grade science education." It's unlikely anyone would ever be able to implement a large scale fraud using these Man in the Middle attacks, but it is worth being aware of the risk. There is a video at the end of the article that basically walks through how to pull off the attack. I found this story on Facebook interesting because it echos my thoughts exactly and it was written by one of Facebook's biggest fans. The last series of updates from Facebook is designed to improve the user experience by capturing your entire life on the screen but as I've said for sometime Facebook is simply providing too much information. "Facebook, in short, is losing its luster as an easy place to mingle with friends online, because users have to spend so much time tailoring its filters to manage their social interactions. To make Facebook useful for me, I am forced to undergo hours of bother, tuning settings to get the inflow of information correct. I'm not sure I have that patience." I've argued for close to two years that there needs to be a simple, clean, easy Facebook alternative. Something that allows you to connect with friends and do little else. Google+ has it's supporters but I've already tuned out because I couldn't find anyone I knew using it. I'd argue that Twitter could create an interesting Facebook alternative if they tweaked a few things. The technology behind Facebook isn't that hard to replicate but getting 800 million users will be hard to beat. In much the same way Google crushed Yahoo (which had become an ad driven monstrosity in 1997-98) by offering a simple, clean, search box, I think a basic connection tool could upend Facebook. If that happens, remember you heard it hear first. This story somehow slipped past my radar a couple of weeks ago. There have been many stories about the government propping up new nanotech projects in and around the Albany area. For the most part, these projects have been long on promise and short on results. However, there was a story last week detailing a huge new complex going up next to the University of Albany. "The massive building now rising amid a shroud of secrecy at the University at Albany's nanotech complex is part of a major push by the semiconductor industry to develop the next generation of computer chip manufacturing. If the venture succeeds, it will place Albany at the center of the worldwide semiconductor industry. Renderings and other documents obtained by the Times Union show a dramatic, 500,000-square-foot structure that will nearly double the size of the existing College of Nanoscale Science and Engineering campus. The project, to be built in two phases, is rising opposite Washington Avenue Extension from the existing campus." As the father of an 8 yr old who took Snap Circuits into school last week to represent her favorite "toy", this kind of news makes me hopeful there could be a future for our kids in NY. Last week all of the talk was about the pending Greek default and what that would mean for European banks. Stocks had their worst week in 3 years and there was talk of a Lehman-like event coming as early as Sunday in Europe. However by about noon yesterday the rumor mills were cranked up to high speed that European Bailout #624 - This time it's personal! 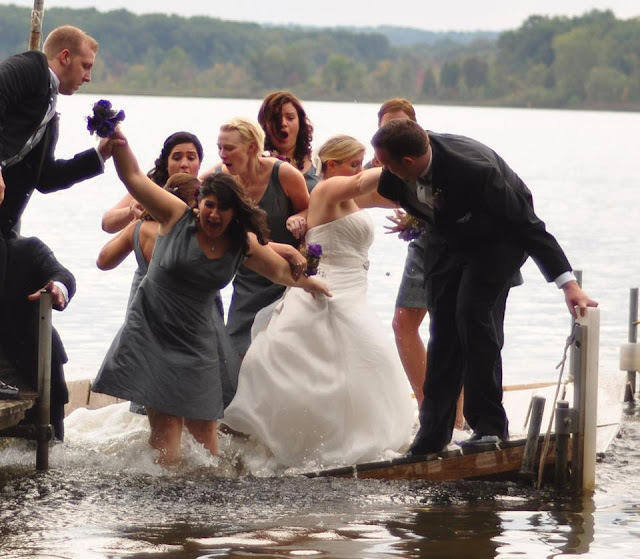 - was going to be the mother of all bailouts and stocks bounced sharply. That rally has continued around the world even though the Germans continue to discount any talk of multi-trillion Euro bailouts. The news flow out of Europe will continue to be volatile as every austerity vote is likely to be followed by strikes and protests. This is some really stunning news concerning the pace of new home construction in the US. "The Census Bureau started tracking New Home sales in 1963, and the record low was 412,000 in 1982 - until that record was broken in 2009 - and then again in 2010 - and it looks another new record in 2011." Think about that - in 1982 coming out of the '81 recession with mortgage rates at 13.5% !!!! we had new home sales of 412,000. In 2011, despite the fact that our population that has grown 33% since 1982 and mortgage rates are at historic lows, we are project to build and sell just 303,000 new homes in the US this year. I'm as guilty as anyone of being bogged down in the day in, day out moves of global markets and we occasionally forget to look at the big picture. This is one long-term data point that should concern any policymaker in the US. The lack of quality middle class jobs and the excessive debt burden of 20-somethings has drastically slowed new household creation and when coupled with a huge surplus of foreclosed properties has crushed the new home construction market. I mentioned this yesterday on my twitter feed - @grindstone_fin - but here is reason #462 why I'm not on Facebook. "According to Cubrilovic’s tests, Facebook merely alters its tracking cookies when you log out, rather than deleting them. Your account information and other unique identifiable tokens are still present in these cookies, which means that any time you visit a web page with a Facebook button or widget, your browser is still sending personally identifiable information back to Facebook." Now Facebook has come out and denied they'd ever do anything with this information and of course you should trust them. Facebook continues to work toward training our society to devalue privacy. It's becoming increasingly difficult to stay out of the Facebook world as more and more websites REQUIRE a Facebook account to login, however, I'll hold out as long as possible. There are many headlines out of Europe tonight that I'll let you try to decipher if you're really bored. In general, the thinking seems to be European leaders will piece together some sort of bailout (n+1) and that will stabilize Europe for at least 4 hours - @sarcasm. The Office of the Comptroller of the Currency publishes a little read report on Bank Trading and Derivatives and page 14 of that report sort of jumps off the page at me. Remember way back in 2008 during the financial crisis when 1 or 2 banks triggered a threat to the entire banking system because of the concentration of risk? Yeah, well apparently you and I are the only ones that remember that because the concentration of risk in derivatives is higher than ever. The top 4 banks - JPMorgan, Citibank, Bank of America and Goldman represent 96% of the outstanding US derivatives exposure principally in those dangerous CDS. I've seen far too many video clips of the tsunami in Japan but this is the first time I've seen one from street level. The amount time that elapsed between "everything is fine" and "complete devastation" was unbelievably short. European markets are off sharply today, down 4-5% across the board, as result of the lingering effects of the Fed announcement and a slew of ugly data out of Europe. 2) Initial jobless claims FALL! scream the headlines today. Ugh. Someday, we'll get everyone to write stories that represent reality. Jobless claims were revised higher for last week and remain well above 400,000 which is very troubling. Also, note an additional 103,000 people fell off the unemployment rolls last week. For the most part these are people that joined the other 1.6 million who are no longer receiving any benefits. 3) There seems to be a growing consensus that Europe has re-entered a recession and I've heard more than one economist say that the US probably entered a recession in the past couple of weeks. If true we're looking at a very tough environment for the US economy over the next 2-4 years. We've exhausted almost every possible fiscal policy tool, spent trillions on stimulus/bailouts/war and we're still slipping back into a recession -- ugly might not be adequate enough to describe the situation. 4) Finally, just because I was feeling so cheery today, I thought I'd mention that Bank of America is looking very Lehman/Bear Stearns like as people are starting to talk about counterparty risk after a downgrade of the bank yesterday. Remember, Lehman wasn't a scam along the lines of Enron. Lehman was a bank who's partners lost confidence in their ability to survive. Since no one wants to be the last one off a sinking ship everyone rushes for the exits at the same time. Then things get interesting. * Housing starts missed expectations and dipped to a 3 month low. * Italy's rating was cut by S&P and their outlook remains negative. * China has been playing cat and mouse with the US and Europe. Last night they threw a wrinkle in the "China will save Europe" story by saying "EU DEBT CRISIS MAY RAISE CHINA TRADE FRICTION." However, today (and tomorrow) the markets will be fully focused on the Fed. The current expectations are that the Fed will work to raise 10yr rates and lower 30 yr rates - through operation TWIST (I'll give you the 30 second breakdown on TWIST if it comes to pass). While it is considered a slim possibility there is an outside shot at outright purchases of $200-$400 billion of bonds. If that were to occur you'd get a brand new round of skyrocketing stocks, food/gas inflation and dollar depreciation. Again, that has a very, very small chance of occurring but we have to keep our eyes open to all of the possibilities. This article from the Toronto Globe and Mail has sparked a good deal of discussion in Canada in recent days. The crux of the article focuses on the work ethic and life expectations for current university students in Canada and some of the findings are interesting. "Ken Coates sat in on a recent presentation to executives of some of Canada’s biggest companies. It reviewed the results of a massive survey of university students about their work expectations. The survey found that work/life balance and vacation time ranked extremely high on their wish list. They also expected high salaries and quick promotions. On average, they expected a starting salary of $53,000 a year." Okay, so far, that's not great, but who doesn't want work/life balance when they are 19? "The entitlement mindset didn’t come from nowhere. It came from us. It came from a generation of adults who believed that kids should never be allowed to fail, or told the truth about their abilities, or learn that getting what you want is sometimes hard. On top of that, we have the modern fallacy of higher education – much beloved of politicians, who believe the acquisition of a BA is a sort of alchemy that can transform intellectual dross into gold and ensure that everyone, no matter how inert, can succeed in the knowledge economy." "The best are as good as ever, maybe better. The top 15 per cent or 20 per cent – the same students who would have gone to university a generation ago – really do crave intellectual engagement." We remain locked in a vicious cycle of "Europe is saved let's rally" followed by "Europe is broken, sell, sell, sell". Today we hear that there are further concerns about Greek debt levels and their in ability to actually institute the cuts they've described. European markets are down 2.5-3% which would have been major news just 2 months ago, but 3% swings have become the norm on Wall Street. Unfortunately, all of this volatility is having a real impact on investor confidence as investors pulled more than more money from the market than at any point in the past 2 years. President Obama will role out a new set of proposed tax increases today to help cut the deficit. This proposal has the same chance at success as you do winning the Powerball. Some of the ideas are fair and sound, but in the run-up to 2012 there is no way Congress is passing any new taxes. * Raise tax rates for individuals with income exceeding $1 million and those making more than $10 million per year. There could be a 5.4% surtax on joint returns above $1 million and individual returns above $500,000. In theory that could bring in as much as $480 billion over 10 years. * Lots of ideas around mortgage interest deductions. They might consider eliminating it altogether, eliminating it on second homes (very easy to work around that, but I charge for that kind of info :) ), reducing it on first mortgages from $1million to $500k, etc. * Going after hedge funds and their 15% tax rate. This is long overdue. * There is also some talk of a tax holiday to encourage repatriation of profits but the more I've read on this subject the less I'm convinced it will do anything to spur job creation. We should have the full details by 10:30am. The skeptic in me thinks that this will be little more than a talking point during the debates in October 2012. President Obama "If Congress had just let me raise some revenue from billionaires, little Suzy's mom would have got 12 extra hours at Walmart this week and she could have bought her that iPad she wanted for Christmas." You'll have to tilt your head a bit to read this but I found it very interesting. @alphatrends (Brian Shannon) posted this note from his local Burrito restaurant. 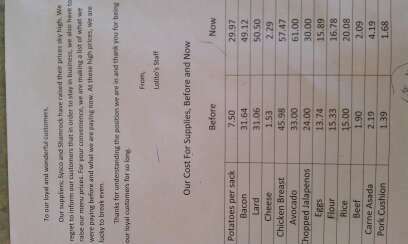 It highlights the price increases that have been passed along by Sysco to the restaurant this year. Those are some painful price moves. "It is claimed that a one millisecond advantage could be worth up to $100m (£63m) a year to the bottom line of a large hedge fund." "The laying of the new transatlantic communications cable is a viable proposition because Hibernia Atlantic, the company behind it, is planning to sell a special superfast bandwidth that will have hyper-competitive trading firms and banks in the City of London and New York queuing to use it. In fact it is predicted they will pay about 50 times as much to link up via the Hibernian Express than they do via existing transatlantic cables." There is too much money involved here for anyone to do the right thing but at some point this arms race to trade first is going to end poorly for us all (see the flash crash of 2010). Stocks rebounded yesterday and are up sharply again overseas this morning hopium that maybe Brazil, Russia, India and China will bailout Europe. While the finance ministers of these countries have been much more cautious in their statements it hasn't stopped the rumour mills from churning out enough stories to save the market so far. However, it's worth noting that yields on Greek 1 year debt crossed 145% today so maybe all is not well. One of the greatest myths of investing that has been put to the test repeatedly during the dotcom collapse and the 2008 recession is that diversification across asset classes will help protect investors during periods of volatility. Unfortunately, it appears as though the exact opposite effect occurs. 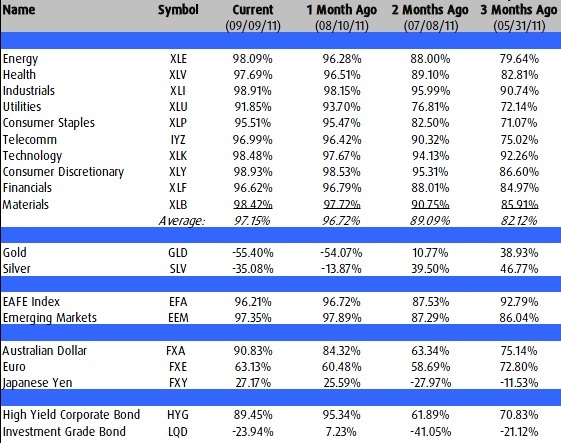 The more volatile the markets, the more most asset classes seem to move together. I think that the increased level of programmed trading has only heightened these correlations. Look at those correlations to the move in the S&P500. Utilities and Consumer Staples were long thought to be safe havens in rough seas. However, when times are tough they are basically marching in lockstep with the S&P. As someone said yesterday after seeing this info "If you still want to be in the market, fire your advisor and buy the S&P"
Bank of America ramping up foreclosure efforts? There has been significant slack in the foreclosure system as many banks chose to wait out the recovery hoping things would pick up and borrowers would suddenly be able to make those mortgage payments they've been skipping since 2009. Yesterday came word that BofA was making a move to substantially increase it's rate of foreclosures. "It appears the numbers you noted to me this afternoon generally track with our own numbers for key categories. It should be noted it’s driven more in key states like California and Nevada than overall, and certainly the progress we’re seeing is limited to non-judicial states. Judicial states continue to move very slowly, with key states like New Jersey only beginning to start processing foreclosures again this month." Ultimately, this will be a painful process for the individuals involved but I think it will lead to a healthier market in the long-term. "A man charged with murder got an unexpected note in the mail -- a jury duty summons for his own trial in Schenectady County Court." Europe looked very dismal this morning with several indexes down 4-5% before beginning a sharp reversal once the US markets opened. Rumors of emergency market interventions seemed to have stabilized things for the time being but the situation remains very fluid. The market it seems can never get enough QE or cowbell for that matter. Update: Things have weakened again as expectations for future stimulus seemed to have stalled a bit. Oh, and Greek debt - yikes!!! The yield (interest rate) on 1 year notes from Greece hit 139% today. That's clearly an indication that there is no expectation Greece will be able to make good on those payments. Update 2: Holy rally batman! The markets went off to the races in the final minutes on a strange article from the FT.com that hinted at a possible Italian bailout by the Chinese. However, just three days ago, the Italian Economy minister said Asian investors were hesitant to buy Italian debt. It doesn't look like much (Dow up 70 and Nasdaq up 27) but given the crushing blows overseas markets received today, this is a pretty stunning performance. I don't think there is much to this rumor, but it doesn't matter what I think, because the market bought it with both hands today. Asian markets are off in early trading (down roughly 2%) on fears that the news flow out of Europe is going to be ugly this week. There is talk that the French banks could face a downgrade from Moody's which might lead to a downgrade of France. The Eurozone is also rumored to be considering ways to allow for an orderly bankruptcy of some countries and/or allowing some countries to leave the Euro. As we reflect on 10 years since the events of 9/11/01 I saw some amazing data on the way the world has changed in the last 10 years. * Total US debt has gone from $5.77 to $14.69 Trillion. Did the 2012 campaign officially kick off tonight? In general, this was one of President Obama's better performances of late. I'll get to the details in a second but I thought the speech displayed the sort of passion we need to see from our leaders at a time of great vulnerability. I will say that some of the rhetoric was over the top "If Americans can by Hyundai's, Koreans should be able to buy Ford's". Should we qualify that by saying "American Made Ford's" because I saw new yesterday that Ford was breaking ground on a new $1 billion factory in India, but I digress. Hmmm, $470 billion is real money. Didn't we nearly bankrupt the country over less than that? All of the spending cuts are undefined at this point. Sounds good, but speaking from experience school budgets are relatively fixed items and school schedules are set. You can't just hire back a teacher in November without any students to teach. Back to my familiar refrain. As a small business owner, cut my taxes, I'll say thank you and maybe buy a new jet ski, but I'm not hiring until demand picks up. We've done this repeatedly since 2001. Frankly, I'm amazed any company has any assets on their balance sheets. Like quantitative easing for the stock market, write-offs have become corporate crack. I loved the idea of infrastructure rebuilding in 2001. 2 wars, $8 trillion in debt, bank bailouts, etc, have dampened my enthusiasm. Also, I see what we get for our dollars up close when traveling around the Northeast. There is one project in NJ - it's a nice upgrade to a major intersection with a new bridge. It should improve traffic flow dramatically, but it's basically a bridge with 1 new on ramp. Total cost $1 billion. China can build a small city for $1 billion. Again, this is nice in concept but when you start modernizing schools you start knocking down walls and you'll discover the joy of pricing out an asbestos remediation contractor. The cynic in me fears that layoffs might grow over the next month. Layoff 100 workers today, rehire them in 6 months. Collect $4k for each worker. Profit! This further hinders our entry-level workforce. If we keep extending benefits there is no incentive for people to seek out the many entry-level jobs that are available. Goldman has come out saying that the deal is slightly larger than expected. Another firm ran a model that said the package might add 300k jobs (with millions unemployed that seems pretty weak). Unfortunately, I think this is ultimately going to prove to be little more than a campaign flyer bullet point. Maybe I'm wrong, but I expect major opposition to emerge from the House. Wow, Labor Day was a pretty timely holiday for the US markets. While the rest of the world crashed on Monday our markets remained closed. Yesterday's see-saw action has given way to global rally today because...... insert random market cliche here. The real reason behind the rally seems to be that a German court upheld the latest bailout of failing Eurozone countries. We'll see if this holds because Europe remains a whole risk to the global economy. I'm often accused of not only seeing the glass as half empty, but cracked and leaking water. However, after 10 long, painful years of driving past the site of my former workplace (7 WTC) and my former classroom (51st floor 1 WTC) ﻿I was encouraged by this cool wide angle picture of lower Manhattan and the WTC reconstruction effort. Sidenote: it's amazing the memories held in this photo for me - my old softball fields up under the Williamsburg Bridge, jogging across the Brooklyn Bridge in an effort to lose the freshman 15 (okay freshman 30), my first "job" at 70 Pine St., temping in the Woolworth building, and down in the left hand corner you can almost see my old boss' office in the corner of 2 World Financial. "Visualplanet is launching a transparent film called “touchfoil” today that can turn any surface into an interactive touchscreen. The foil can turn large regions of wood, plastic, glass, tabletop, and shop window into giant interactive surfaces that behave just like tablet touchscreens. It is thinner than an average business card, making it easy to adapt to a variety of surfaces. The touchfoil can cover surfaces ranging from 30 diagonal inches to 167 inches." My favorite part of the story is that despite this insanely cool technology this company remains self-funded. Every dotcom social gaming company in the US is raising $100 million to fund operations while this British firm hasn't taken a $ of VC money. Sell the open, buy at the close of Europe, Profit!!! The market continues take the path that seems a little too obvious. Things look bleak and the market dipped throughout the morning on continued weakness in Europe. When Europe closes at 11:30am the computers step in and march the market in in an orderly fashion back toward the green (yes, the Dow was down 100 today, but the broader indexes were down just fractionally). We'll see how long this trend can continue. The next big catalyst for the markets is likely to be President Obama's Thursday night job speech. I think the big question is: Will we see something that the President thinks will actually help the economy or is this mere posturing with a proposal that has no chance of passing in Congress? I don't know what the answer is - I suspect some form of "architect ready" projects (instead of the infamous shovel ready from the 2009 stimulus) to boost infrastructure and some talk of payroll tax cut extensions. None of these ideas will do much to move the needle in our $15 trillion economy, but perhaps there will be something novel that I haven't thought of. The European markets opened for the first time since the dismal US jobs report and proceeded to dip about 2% at the open. However, that was just the beginning of the fun. Belgium and Italy appear to be falling behind as their latest economic data suggests they are now hitting stall speed. Coupled with a major Germany banking CEO saying most European banks wouldn't be able to absorb the losses on sovereign debt if they were forced to recognize their actual market value, the markets couldn't catch their breath. The fact that this CEO's bank was all over the TV this weekend spending major dollars as a sponsor of a golf tournament was irony that wasn't lost on me. The major European indexes finished down about 3-5% and there has been little reversal so far in Asia. With another solid down day or two, the US markets will have given up practically all of the Bernanke inspired QE3 gains. I expect we'll hear a slew of comments early and often tomorrow about the size of QE3, other Fed policy options and Pres. Obama's stimulus plans and potential tax cuts. As I've said repeatedly, businesses are not hiring because of a lack of demand not because of our current tax structure. Expectations were for 70k jobs created in August and the actual number came in at zero. Yes, you read that right zero. The unemployment rate was unchanged, but July's number was also revised down substantially. This is definitely worse than I expected but as I said yesterday, expectations are silly. The reality is the jobs market is bad and deteriorating. If we had shown growth of 20k, 50k, 100k or 0 jobs in August it wouldn't really matter in the big picture because we aren't growing. Average hourly earnings were down, the average work week was down, part-time employment was up, the birth/death model was +87k (who knows how much that added to total jobs but it was inline with my guess of +70-90k) and over 165k people just left the workforce. All told this is about as weak a jobs report as we've seen in the past couple of years. If I could recommend some stimulative spending: The BLS needs to buy a couple of new servers. It's 10minutes after the release and the full statement still isn't accessible online. So far the market is reacting negatively to this news, but watch for the QE3 cheerleaders to try and stage a rally on this bad news. The numbers are all over the map forecasting tomorrow's jobs number. The current consensus is for about 70,000 jobs but that number is falling fast (Goldman cut their estimate from 50k jobs to 25k jobs today) and some are even predicting a negative number. Here's the deal: it doesn't really matter if the number is 50k, 30k, or 80k. We are producing jobs at a rate far below what would be considered normal for this point in a recovery. I mentioned to a friend that this game of beating expectations is like saying "we expected 500 houses to be submerged by Irene, but only 496 were actually flooded so it's RALLY TIME!". The reality is that the job market is weak (and anectdotal evidence suggests it's getting weaker) and nothing - not tax cuts, stimulus plans, or QE3, QE4 or QE5 will change that. Until demand for goods and services increases businesses will not begin hiring. Anyway, back to the jobs number - I think the smart money would say somewhere around 40k jobs might be a good guess, but I think there is a fair chance that some of the blackbox data is going to throw the number off. I think there is a chance that the number is above expectations if certain things fall into place. That brings us to the market's reaction - a bad number would signal an economy stalling out and confirm beliefs that Pres. Obama will offer additional stimulus and the Fed will expand the expected QE3. Thus, stocks could rally on bad news. A great number - 100k+ - might lead some to reduce their expectations of government intervention which might cut the legs out from this sharp rally we've since Bernanke started talking 2 weeks ago. I'll try to post a quick update after 8:30am.